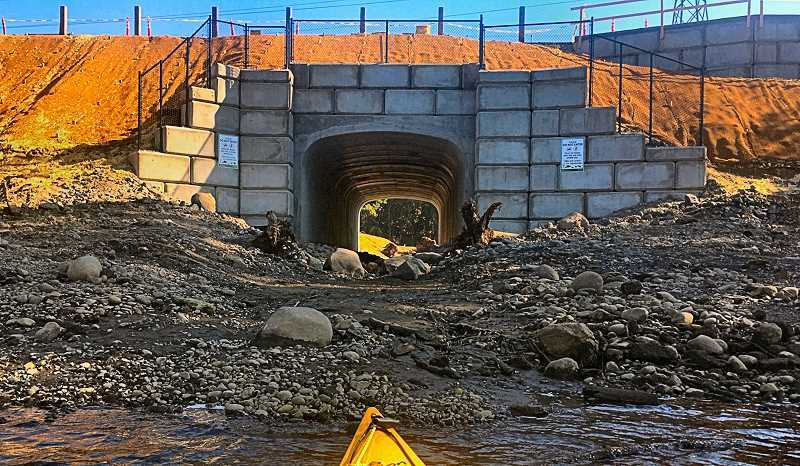 Thought you might be able to use this photo of the new culvert, taken from my kayak on October 20. A vantage point trail users won't normally see. On Tacoma Street, during the morning commute, vehicles wait to turn westbound on Tacoma – especially from the side streets on the north side of Tacoma. Those drivers should be right there and ready to move into the moving traffic. We're glad to let you in, but we shouldn't have to make a deliberate stop to do that. A pause, or just the traffic moving slowly, allows you – if you are ready to go – to just slide right into traffic so the traffic can continue to move along. Don't just sit back there by the stop sign and wait for someone to stop and signal you to enter with their hands, like you aren't paying attention. That is not needed. Let's keep the traffic moving smoothly on Tacoma. In the "Tennis in Sellwood Park" letter to the editor in the November edition of THE BEE, William Adriance was advocating that the northern court be preserved as a tennis court and the southern court be converted into the four pickle ball courts. However, I'm almost 100% positive he meant to say that the southern court should be preserved as the tennis court, as that is the nicer court with the nicer view. Plus, the pickle ball players have already been using the northern court and have unofficially converted it into pickle ball courts with tape, etc. In my humble opinion, the lower two courts should stay tennis courts, with one of the upper courts being converted into four pickle ball courts and the other one into a futsal court. This seems like the fairest ratio for the tennis players (we are still here). To David Ashton – thank you again for taking the time to cover the Forum in September. Great write-up and thank you for including that last paragraph re: the Rail Yards. There was actually one question posed to the electeds but none of them gave any real answers to it re: the rail yards. They seemed to brush it off. That is still on our radar for sure. In fact, we understand that Linda George over at PSU may actually do some monitoring of the yards with portions of the grant she received from the EPA. The DEQ will get involved to some degree but they will play a small role. I did have a long phone conference call with them a few weeks back re: the Union Pacific rail yards specifically as there are a number of new people in DEQ who have no knowledge / history of the yards. So the call was to bring them up to date on the history and current situation. And there are a few people at City level who would like to talk as well. I want to comment on the article "Diesel Pollution Town Hall Forum held in Brooklyn" in the November issue. It's great that David Ashton covered this forum on an important issue. But one thing irked me: He discusses points made in a presentation by Dr. Patrick O'Herron regarding dangerous hydrocarbons in diesel pollution. Ashton writes, "'...and many are carcinogenic, estrogen receptors, or genotoxic,' he opined." 'Opine' means to hold and state as one's opinion. Whereas O'Herron is presenting scientific fact, is he not? If Ashton wants to dispute the facts presented, he can check the scientific literature, but by using the verb 'opine' he is saying it's just one man's opinion. This trivializes the matter and is no service to the reading public. EDITOR'S NOTE: We asked Ashton about that, and he said he believes the sentence was changed in editing. He reports that the original sentence he wrote was,"In one of his first graphics, 'Polycyclic Aromatic Hydrocarbons (PAHs)', O'Herron mentioned that it is these PAHs in diesel pollution that contain a large family of organic chemicals including benzo(a)pyrene, dioxins, and naphthalene; and many are carcinogenic, estrogen receptors or genotoxic. 'These often enter the body on or in particulate,' he said." THE BEE has been following and reporting on this issue for over a decade, and will continue to do so. The solution, it seems to us, is to lobby legislators in Salem to adopt a rule targetting old diesel engines that coincides with what both California and Washington have passed, thus ending the ready market for such vehicles in Oregon, which is at present the haven where they all end up.